Joel’s father, Charles Haertling, was a well-known architect in Boulder, had designed a bunch of futuristic looking houses, some of which had appeared in the Woody Allen film Sleeper. He had his office in the basement of the building that now houses the “Riverside”, a breakfast/lunch café on Broadway beside Boulder Creek. With Joel’s father lately deceased, he had the run of the office to himself. Having been born in Boulder, Joel was always a very proud native-Boulderite. This is a common enough phenomenon in Boulder. Call it Boulder-centrism. There are many of us who suffer it to one degree or another and I am as guilty as the next. It was clear to me from the very beginning of my relationship with Joel that David and I would always be East Coast usurpers, outsiders, in his eyes. Thirty years of us living in Boulder has apparently done nothing to change this. We first met Joel Haertling via connections made with Rumours of Marriage. He appeared with his French Horn on the “Couch Dots” sessions, which represented the dissolution of Rumours of Marriage and the first nascent beginnings of what would later become Walls Of Genius. With Walls of Genius, we had made a real effort to “fool” the spread-out underground scene into believing that there was an explosion of weird experimental music in Boulder, Colorado. This was the natural outgrowth of our habit of having a different name for the group every time we recorded. We realized that by rejecting the “regular” path that most bands take, with a single band name, that we could pursue yet another angle, that of creating this illusion. It turned out that it was a self-fulfilling prophecy, as there were a number of underground scene participants just waiting to be discovered in Boulder. Naram Sin (John Martinez) and Doll Parts (Charlie Verrette & Lynn Ablondi) were among these groups, as was Architects Office. I don’t recall how I became involved in participating and recording A/O. I wish I remembered more, but then maybe my lack of recollection is the proof that I was really there. At this time, we were able to give Architects Office a jump-start into the underground scene, as we had the connections to get the music reviewed. Some reviewers didn’t understand the relationship and assumed that A/O was taking the same absurdist positions as WoG. This very likely agitated Joel, because we clearly did not take ourselves very seriously, but he did. He was also evidently unhappy about the tone of our promotional material. Again, although we were seriously pursuing what we did, we were in the business of self-deprecating humor as well. Although we did not promote A/O as a “clone” of WoG or discuss it in the catalogs as blithely as our own material, there was still the matter of the whole overarching Walls Of Genius “thing”. So even if A/O was discussed sufficiently seriously in the catalog, there were still pictures from pornographic catalogs, ridiculous cartoons and diatribes, as well as commentary from the “Head Moron”. I believe that Joel either didn’t “get” the joke or, in the long run, simply preferred to not be associated with it. Our relationship was troubled early on. Joel had whispered into the microphones at the Festival Of Pain and his girlfriend had been twiddling the knobs on the recorder, thus making most of what I recorded at the Festival not suitable for listening or release of any kind. David indicates that we worked this out with Joel and although I don’t recall those interactions, we must have, because David and I continued being involved in some of the earliest A/O sessions with Joel. If we had severed ties at that time, those recordings and performances would not have happened as they did. Somehow we entered into an agreement with Joel to market A/O under the WoG “label”. At that time, we made no money from what we sold. We took the money we made selling cassettes and turned it right around to buy more cassettes, to print more catalogs and to pay postage for sending the cassettes and catalogs via snail mail. So I seriously doubt we offered Joel any monetary compensation for doing this. It was more of a question of getting A/O exposure in the underground, getting them reviews, and building on the illusion of WoG representing an entire experimental scene in Boulder. The first time we encountered Joel Haertling was during a Couch Dots jam at Mikal Belan’s house. For those not keeping score, Couch Dots was the free improv version of Rumours Of Marriage, the band in which Evan (and I) met Ed. Mikal was selling off many of his rare records to raise money for his move to New York, and Joel saw an ad and came by to buy some. He ended up joining in the Couch Dots activities by placing radios all around the room. The next time I met Joel, it was when I had shown up for a practice of the Charlie Band, what I call the nameless band that never was (though it eventually metamorphosed into Doll Parts) being formed by Charlie Verrette for which I was trying to play guitar. Charlie invited Joel to the practice and he brought his French Horn and started running things. He told me at one point to “transpose on an F” (sic), and I didn’t know what he was talking about (and still don’t!)…. Sometime in 1983, Joel and Charlie recorded the first Architects Office tape together and Joel gave me a copy, maybe because I had an experimental music radio show. It was packaged in cigarette boxes that Joel had found in the trash somewhere and then painted. The cassette tape happened to fit perfectly in the box. The music was mostly a lot of synthesizer. I remember one piece was ostensibly about nuclear annihilation and Joel asked me if it sounded sad, because it was supposed to sound sad, although it didn’t sound anything like any traditional conception of what sad music was supposed to sound like. It wasn’t obviously sad sounding to me, but I could see it…. The name Architects Office referred to Joel’s father’s office. Joel’s father, Charles Haertling, was a famous architect. One of his houses, with a sort of mushroom design, appears in the Woody Allen movie, Sleeper (which was shot in and around Boulder). There’s a few other of Charles Haertling’s houses in and around Boulder and they’re all pretty crazy, very modern and striking. Once me and Evan attended a party at the office, and while there Evan noticed a Life Magazine article on Charles Haertling. Evan read the headline that said (something like), “Some call him a genius, some call him mad.” Then Evan excitedly turned to me and said, “And he’s here, in this room!” We saw him there but never talked to him. This must have been sometime in 1983. Charles Haertling died in April of 1984. Joel was very fascinated with WoG activities and was thanked in the liner notes of an early release for being the first humanoid to pay money for a WoG tape, which took place at the end of our first live performance, although Joel missed the performance because of coming late. He showed up after we had finished and then bought one of our tapes! We all became friends and felt we were all part of an experimental music scene. Joel recruited Evan and myself to actually play in Architects Office, and by my count at the time, we played in all of the first six Architects Office live performances. At some point, Evan and Joel came to an agreement that Joel would release two AO cassettes through Walls Of Genius, as if we were a record label or something. This was agreed to and embarked on before any of the details were hashed out, leading to later disagreements on the nature of those details, sparking a chain of events that led to some awful tensions, particularly between Joel and Evan, and the relationship fell apart in acrimony. In the meantime, we were both playing in AO, and Evan was recording the shows, which formed the bulk of the two WoG AO releases. My main memories of these shows are of improvising on synthesizer amidst a large array of other people doing the same -- I remember there being as many as six people playing synthesizers -- all along with Joel’s prepared tapes and Evan playing his roto-toms. Joel named the first of the WoG releases Partitions because that’s a type of wall. Although the cassette package design was otherwise all Joel’s (one of the initial sources of acrimony! ), I see it still had one of the “Authentic” stickers that Evan put on all WoG product! Partitions and the later Dispensation by Architects Office were mostly made by me (Evan) on my Dokorder 4-track reel-to-reel. A/O was (and is) primarily the project of Joel Haertling. Thirty years down the line, Partitions and Dispensation still sound fresh and are way less experimental and way more listenable than we ever thought at the time. We “thought” we were being challenging! The music may still be challenging for many listeners, but one thing that differentiates A/O’s releases on the Walls Of Genius label from their later work is the use of percussion and musical instruments introduced by David and Evan of Walls Of Genius. David and I mostly performed percussion with A/O, although David may have used his synthesizer and my bass playing emerges, albeit very rarely. Plant Communicator, Crumar DS-2, French Horn, Mambo Bunny, Pipe Organ, Bassoon, Pro One, Roland JX-3P, Magnetic Tape, Percussion. Rick Corrigan, Evan Cantor, David Lichtenberg, Charlie Verrette, Joel Haertling, unidentified person. Partitions reflects a couple of tracks that evidently did not involve me. They were likely made by Joel Haertling at the “Architects Office”. 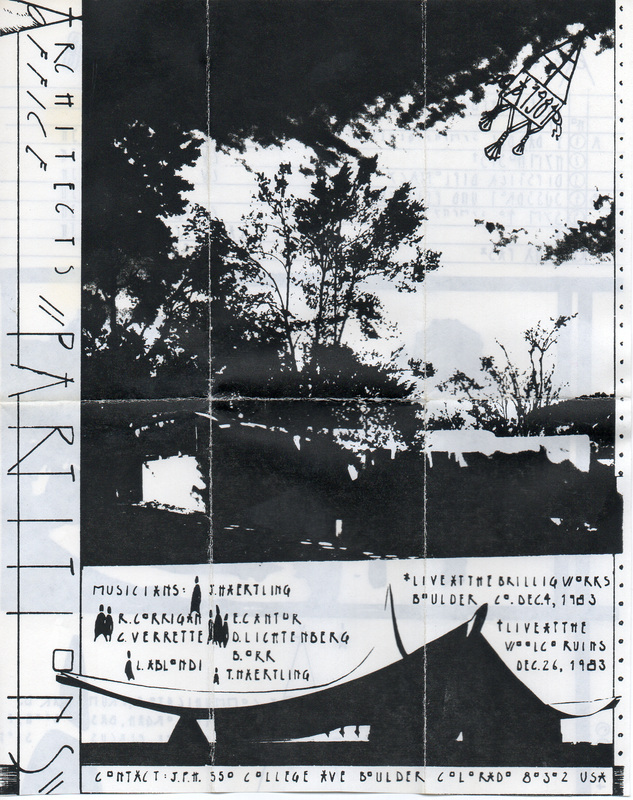 Otherwise, Partitions featured material from live performances at the Brilligworks, December 4, 1983 and the “Woolco Ruins”, December 26, 1983. The “Woolco Ruins” session was held in the empty store space before the shopping center was demolished and/or renovated. That location is currently an REI and a Marshalls retail center. This was a huge indoor space, like multiple gymnasiums lined up together, and I fashioned some lengthy microphone cords in order to record the session on 4-track, one microphone in each corner of the space. The Brilligworks was one of two coffeehouses in Boulder at that time (the other was the Trident, still operating). Walls Of Genius had performed at the Brillig, so we had a connection. Listening to Partitions as I write, I’m not sure that I can describe what’s going on any better than a casual listener could, but I’ll see what comes up that I can lend some insight into. About five minutes into Side A, there’s some bass playing that rather sounds like Evan’s (and I seem to recall that being the case). Whosever’s it was, I’m pretty sure it wasn’t being played live but was something on Joel’s background tapes. Joel would carry around a portable tape recorder and clandestinely record people and things. I think he may have recorded Evan at the earlier mentioned Couch Dots jam! There’s a lot of conversation, and this was either another result of Joel’s recordings or it may have been live, this being a recording of a live performance with a very noticeable live ambiance. At about 6 minutes in, I hear Charlie Verrette’s voice saying, “Give me a break, Joel!” This was definitely on the backing tape! Soon after there’s a synthesizer pattern that may have been me utilizing the programmable feature of my Sequential Circuits Pro-One. For a while, my synth is the main one I hear. At about 12 minutes, Joel’s French Horn can be heard, through some effects. Also could have either been live or on the backing tape. At 17 minutes I hear some bongo playing that sounds like mine, though I don’t remember ever doing that in AO. At about 26 minutes, we hear a snippet of Classical music. I recall Joel quoting Classical music frequently in his backing tapes. I don’t think I was paying any attention to that guy talking on this backing tape (much less knew what he was saying!) when I was playing, I just played whatever I felt like. At the conclusion of the first piece, Charlie Verrette is heard announcing a ten minute break to the audience…. “Hymnosis” was fully improvised at the time of this recording, but it ended up being a recurring piece for AO, a rarity. I had programmed a little catchy riff on my synthesizer that I just happened to pull out during what turned out to be this piece. Joel liked it a lot, and he wanted me to repeat it for future shows for this piece, making this piece semi-written as a result. There’s some (hymnal?) organ on the backing tape that also helped define this piece, and also helped me know when it was playing and thus when to bring out that riff at future shows. Even after I left the band, Joel continued to replicate this riff (as well as he could without me) for performances of this piece. There appears to be a fourth piece on Side A, although only three titles are listed. This fourth piece appears to be a studio as opposed to live recording, which the first three tracks are. Actually, it’s probably “Dipstick Diplomacy” and either “Hymnosis” is split in two or the third track is unlisted. And then lastly there’s a couple of minutes of crowd sounds backed by organ sounds. I believe this was recorded by Joel after an AO show that provided one or more of the other tracks. Joel most likely provided the organ tape, too. I think I hear myself saying, “I don’t think so” and laughing. At just about the very end of Side A, we hear Charlie saying “Joel” emphatically twice (THIS was evidently live! ), and then at the very, very end there’s a split second more of my laughter. I think that was a fellow named Pete Saucier that I was talking to at that point. He later made a couple of synthesizer tapes of his own under the name of Musical Industrial Complex…. At around the eight minute mark of Side B we hear Charlie once again, this time on the backing track, saying, “That’s Daniel Miller, right?” The second track on Side B has a conglomeration of synthesizer sounds and Evan playing an arrhythmic percussion part. Despite what Evan says, I think Joel liked his percussion, especially (though not exclusively) when it was arrhythmic like that. That said, I believe Joel rarely said anything about anyone’s playing, pro or con (my riff for “Hymnosis” being an exception). We just did what we did and it was what it was! At the 19 minute mark, I hear a child’s voice, which may have been Joel’s young son, Trevor. Whether or not that was Trevor right there, my memory is that Joel used recordings of Trevor pretty liberally in his backing tapes. Trevor may have had permission to play some of the synthesizers, too, though I shooed him away from mine once, and then I felt guilty when I saw him pout and remembered what free rein he was generally given. He’s credited in the liner notes as T. Haertling. I’m pretty sure he wasn’t more than 5 at the time…. At the 22 minute mark I hear some recorder playing, which sounds like Evan. I guess he got off his roto-toms and played other things, in WoG fashion, more than I remembered! There’s some bongo playing a minute later that again sounds a little like mine…. At about the 30 minute mark, after a pause following some applause following what I think was the second track of Side B, we hear a repeated ascending sound. I believe this was the voice of Lynn Ablondi, recorded by Joel during an emotional breakup conversation she was having with (you guessed it) Charlie Verrette. I don’t recall Lynn playing in AO (though she was often around), so I wonder if she was credited for her role in Joel’s backing tapes, though I think the recordings of her were generally made without her knowledge. At about the 35 minute mark I hear a bit of that three bell thing we used in WoG a lot! Again, there seem to be more tracks than track listings. Hidden tracks? The sound that starts at about the 43 minute mark again was a studio recording unlike the bulk of the tape, which was recorded live. Actually, I think that sound there was the sound of a reel-to-reel tape running out – how meta!! Review by Christopher Rankin in Unsound magazine, Volume One, Number Four. 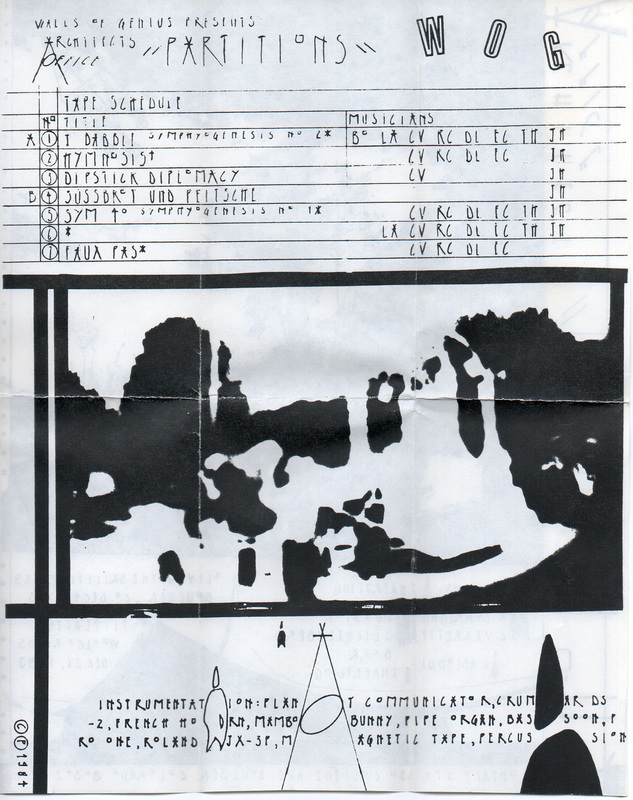 Review of Partitions by Brian Ladd in the 11th issue of Objekt zine, March 1984.